It was exactly one year ago – in the time we’re covering that is, meaning March 1948 – when we had the pleasure of meeting, however briefly, one Forrest Sykes, a long forgotten figure (not that he was ever widely known to begin with) who made a lone record for Aristocrat which was torrid enough in its playing to melt the stylus of any record player it spun on. The song was Tonky Boogie, the first piano-based instrumental in rock, and with it the bar for such tawdry displays in the future was set rather high. Yet with all the focus on saxophone instrumentals throughout 1948 in the rock field there weren’t many piano boogies to follow, something that no doubt wasn’t helped by the fact that Sykes’s record sank like a stone commercially whereas the sax brigade were hitting big with regularity. For months after that only Cecil Gant, who pre-dated all of this noise, chipped in with similarly styled instrumentals without much luck, all while the other keyboard-based artists – Amos Milburn, Ivory Joe Hunter – were focusing on connecting vocally rather than to try their hand – or hands as it were – on pounding the ivories for two to three minutes in an effort to raise the roof. Not until last September did someone else come along in the form of Little Willie Littlefield who rolled up his sleeves and attempted to carve out a commercial niche in this market by letting his fingers fly. Now he’s back for round two, determined to challenge the saxophone for the title of the most exciting instrument in rock ‘n’ roll. It’s a tall order, especially for a 17 year old, but then again at that age nothing seems impossible… even improbable. His first effort in this realm, Little Willie’s Boogie, showed he had what it took to keep your attention riveted with his scalding hot playing. Though the record was more of performance than a proper song it was a good performance… VERY good actually… but it’d take more than just a scintillating workout on the keys to build a career. 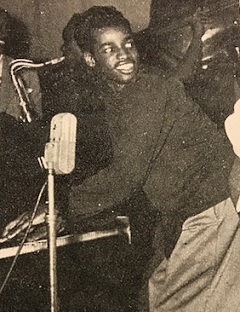 Yet if he wanted to draw attention to himself – as he did when playing clubs as an underaged club attraction deep in the heart of Texas then a rip-roaring boogie was surely the way to go. But would that excitement translate on record and would the rock audience be as quick to pick up on it as those with 12 drinks under their ten gallon hats (or is it ten drinks under their 12 gallon hats?) had been? If you do more than just casually scan the record’s title and artist at the top of each page you should’ve noticed something that stands out about this release before you even started in on the review itself, and that’s the record label it came out on. On My Best Wishes, the B-side of Littlefield’s debut from last fall, a good deal of the focus was on the professional shortcomings of the tiny record company created for the express purpose of getting this kid on wax. Eddie’s Records was as slapdash and shoestring as its name implies and the awful engineering was further proof as to their inexperience if not outright incompetence. But we can’t be TOO hard on ol’ Eddie. After all it was he who thought enough of a 16 – just about to turn 17 – year old kid to actually START a record label in the hopes of breaking him to the public. With no widespread distribution to speak of, no money for advertising, and no connections to get his record on the air someplace Littlefield’s debut wound up being more of an historical curio than a competitive commercial release. Eddie Henry saw the writing on the wall and knew he couldn’t make a go of it in the long-run. The usual problems every independent record label has – scouting and signing artists, organizing sessions, assembling a band, finding a qualified engineer, pressing the records then distributing and promoting those records – are the textbook example of biting off more than you can chew and so rather than choke on the food, he looked for someone else to clean off his plate for him and found him in another local entrepreneur named Saul Kahl, who at Eddie’s urging started Freedom Records. Eddie himself helped hook Kahl up with his limited distributors, offered hard-earned advice and even threw in one unissued master by his only notable artist. 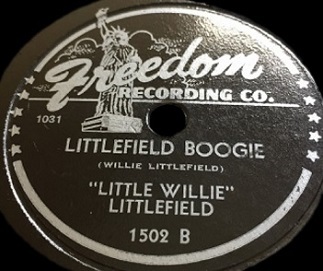 That of course would be this record by Little Willie Littlefield. Because Freedom Records only got the one song by Littlefield in this deal they were faced with a dilemma, one referenced obliquely in the last review for Don Johnson’s record Jackson’s Blues, an instrumental featuring saxophonist Earl Jackson, while the top-side State Street Boogie was a storming vocal performance by Smokey Lynn. The question then was who do you credit as the artist? In that case they had an easily available, albeit unusual, option in that the band on both sides was under the auspices of Don Johnson, so the decision was made to put his name on the label for continuity sake (although Lynn DID get credited for his contributions in smaller print on his side of the platter). That won’t be the case here however, because Littlefield’s presence won’t be on ANY song they choose for the other side. Furthermore it’s kind of hard to call a song Littlefield Boogie (in recent years its been amended by reissuers to Littlefield’s Boogie in case you happen to see it that way and wonder if it’s the same song) and then credit it to an artist who’s not named Little Willie Littlefield. So Freedom Records decided to just split the label credit, giving Littlefield his due on this while serving up an entirely different artist for the A-side, which marked the debut of future rock guitar god Goree Carter on Sweet Old Woman Blues. As its title suggests (though titles CAN be misleading) it’s a blues song as Carter was still caught between styles. Who knows, maybe being paired on his first release with fellow Houstonite Littlefield rubbed off on him because his next time out he’ll be rockin’ harder than anyone. But that’s for later. For now this is the Little Willie Littlefield Show. While the approach on Littlefield Boogie isn’t anything new – a storming piano assault that surely left the keyboard begging for mercy – the particulars are worth getting into all the same. Let’s face it, piano boogies are pretty interchangeable by nature. This isn’t a knock against them but rather the key to their appeal. Because they have a set structure there’s a constant benchmark allowing us to compare them to one another. Boogie woogie consists of a repetitive left hand laying down the rhythm (called ostinato, meaning it doesn’t change as it goes along) which is played hard and heavy, relentless in its precision, percussive in its effect (drums are rarely, if ever heard in strict piano boogie performances, they’d be superfluous) – while the right hand gets most of the acclaim for what it improvises in the 12 bar blues style, maintaining a breakneck speed throughout, throwing in as many ear-catching tricks as possible while still landing back on the root so as to make it identifiable. Boogie Woogie originally are said to have taken hold in and around the turpentine camps of Houston and the surrounding Texas wilderness. The camps employed black workers who in their off hours gathered around the piano and let off steam, the boogie woogie being the means with which to do so that didn’t involve fighting, screwing or drinking, though surely all three were present in great abundance nonetheless. The boogie woogie crazes that followed (and there were multiple eras involved) generally gave each subset of listeners all they could handle. Pine Top Smith’s legendary Pine Top’s Boogie Woogie was huge for black listeners in the late 1920’s. Pete Johnson’s work on the keys behind Joe Turner launched a national boogie woogie craze a decade later that also brought Meade Lux Lewis and Albert Ammons their widest acclaim as it crossed over into white society, seen at the time as both a sign of left-wing idealism celebrating freedoms and a sense of cultural slumming. From there jazz picked up on it, or if you prefer took it back after spawning it originally, and white bands then sweetened it (of COURSE they did) for broader mainstream consumption. Hillbilly bands subsequently adapted it in the late 1940’s and early 1950’s to approach the same musical freedom they witnessed in black America, transferring the boogie to guitar rather than the keyboard. Because of this malleability no one style ever claimed it exclusively for themselves, at least not for very long. As the blues, which it was most often connected with in those early years, began to have a more downcast image associated with it thanks to its primary lyrical themes, the boogie woogie address shifted to back over to jazz temporarily and then to rock ‘n’ roll. But boogie woogie was, as we keep saying, rudimentary and non-changing, which is both its greatest strength and its greatest weakness. Because there’s no advancing it further with experimentation it largely remains stuck in time. Thus styles will use it for a specific purpose and it might enjoy short lived revivals, but it wears thin after awhile. Already we’re seeing that with Littlefield. I suppose that’s somewhat unfair to say because Littlefield Boogie does everything it’s called on to do… and does it with a flourish. He plays a solid left hand pattern and his right takes off like a spooked rabbit. It’s exciting, energetic and shows a good deal of skill. But it also DOESN’T show much to vary it from Little Willie’s Boogie, save the absence of glissandos, and for that matter it also doesn’t deviate much from Cecil Gant and Forest Sykes in the rock jungle, nor from Camille Howard in the preceding black musical motifs which were still going strong. In other words aside from the fury of the performance perhaps, the primary thing separating them in terms of genre identification was the artist themselves and their public association with one form of music or another, and since Littlefield was largely unknown with no built-in fan base it wasn’t a strong bet that this would be noticed by any constituency. Though it’s safe to say that for those who hear it Littlefield Boogie will certainly get any pulse quickening, any heart pounding, any feet moving, it won’t stand out much once you’ve heard another in the same vein and you won’t necessarily be seeking it out, especially without the name recognition to draw you in. None of this is Little Willie Littlefield’s fault mind you, just the nature of the style. For rock to thrive it needed NEW stylistic wrinkles, not the same suit pressed flat each time out. Eventually rock DID adapt the boogie for more varied usage. Other instruments, guitars, horns, etc. began featuring boogie riffs in their songs, often only sparingly, just something to hint at the origins of rock’s restless state of mind. It was the same thing at its core but now simply sliced and diced and doled out in smaller portions, but its intent – and its results – were the same. To get you moving. This record does that I suppose, but we’ve already been moving for awhile and now we want something new to move us. Something… well… a little more modern perhaps. Luckily for us Little Willie Littlefield himself was on the move again. His next stop? Who said the Rock Gods don’t have a sense of humor? Leave a reply on "Little Willie Littlefield: “Littlefield Boogie”"